I'm calling in sick today. But I am not sick. I am just feeling naughty like I did at my first job when I was a teenager and I just wanted to the day off. So bad, I know. How I went from that to the workaholic I am, I have NO idea, I swear. Seriously though, I just need a day off. I am tired. Pooped. Wiped out. I planned on telling you about a little something I have been working on for my Etsy shop, but it is going to have to wait until tomorrow. So I thought I would put a little post together today about what is on my mind today. The little house we took a chance on and "flipped" in this CRAZY market SOLD!! Can everyone please stand up next to your desks and do a little Snoopy dance for me? The very first person that looked at it - bought it. I was so worried about what we had done. Everything is so volatile in real estate right now, so be able to say sold within the first week on the market is AMAZING. I feel so lucky!! On top of reeling from the mountain of work I had just tackled at that house, I took Saturday and Sunday to tear apart and reorganize my warehouse. It was so out of control! My selling season starts again in May, so I have to start working soon so I can get a head start. I found so many cool pieces among my "stash"...I am excited to get started for the year. 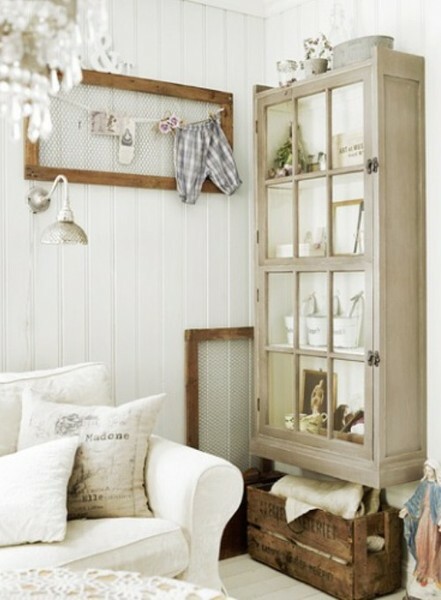 I came home last night and took a look through my Pinterest board for "Furniture Inspiration" (trying to get the juices flowing for projects) and found I had pinned so many pieces I already have in the 'archives'. 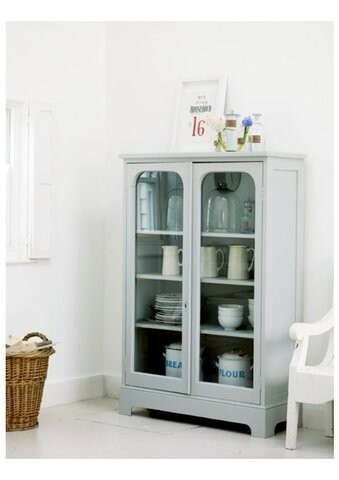 I found a cabinet so similar to this...except the top of my doors are not rounded. I love the gray, but think I will paint the inside white so it is not so dark. 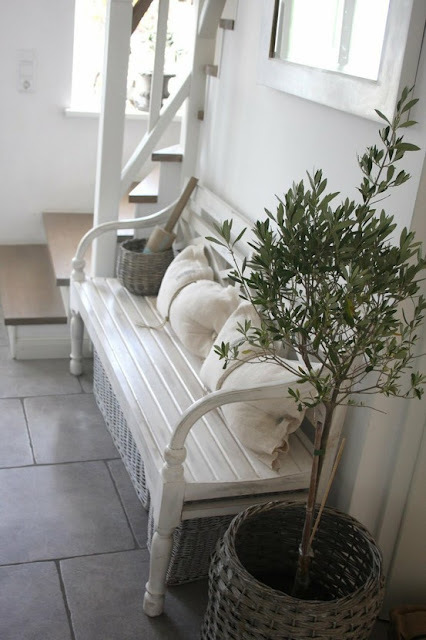 I have been holding on to this bench for about 2 years, avoiding the tedious paint job of the back. I really love how this looks, so think I will make it a point to have it done for the first show this year. 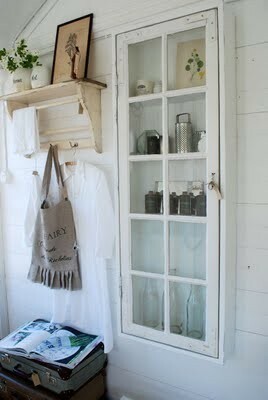 wall cabinets with old windows as doors. These bring back such memories. 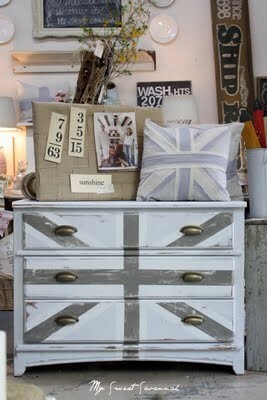 This is where I first started in the world of painted furniture. In 2000, I was 25 years old and turning these babies out by the dozens each month. My friends thought I was crazy!! That was when I was selling on Ebay...waaay before blogging and before I even knew what Etsy was. 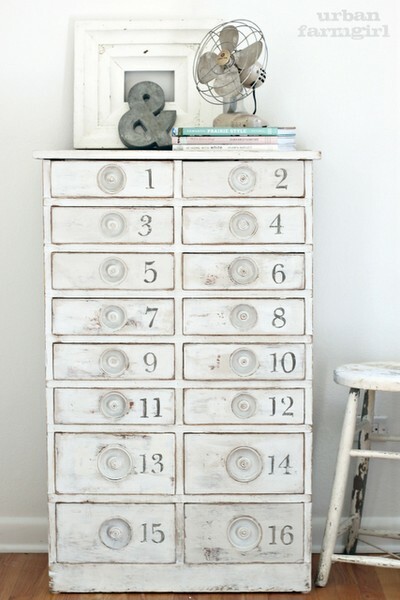 This photo has inspired me to start making them again...I love the double doors on this one. And I came across a stack of windows about this size...yay! for being an old window hoarder! I have a few dining tables I need to get done, too. They take up too much real esate in my warehouse, so I think after these are done, it may be a rare day when I buy another to re-do. 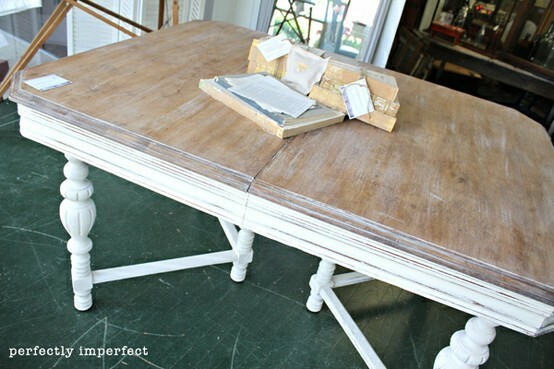 I love the natural, slightly whitewashed top Shaunna gave this table...I have one that is almost exactly the same. I think I might try this look...I love how it looks! 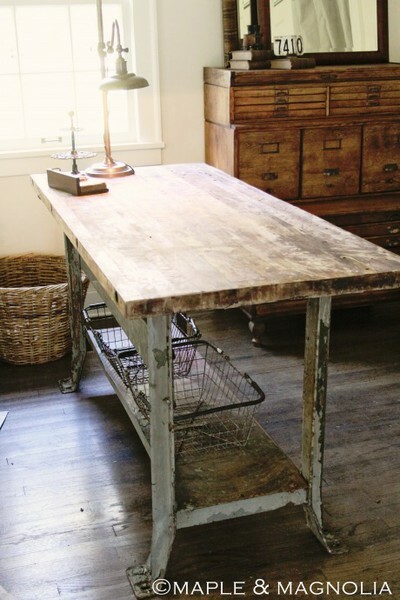 And finally...I have a table that has been tucked away for sooo long that is similar to this. I was marked to go in my studio space in my basement...but it is 7 feet long, and won't fit down my basement stairs. So sad! So...I have to part with it. Or I could hold onto it for 10 years until I move again. But that may put me at the top of the list in the hoarder category, so I guess I will pass it on to someone that could give it some love now. Hope enjoyed my little stroll down inspiration lane. It makes me feel productive to talk about it today, even if I am just going to sit home in my sweats all day. I love the promise a fresh, new week holds! Oohh...and don't forget, there is still time to enter my giveaway from Sarah Jane Studios!